Join the Organising for Power Programme and you get not just high quality training but months of continued support with your campaigns for racial justice! Are you involved in a social justice organisation with a high turnover of organisers? Want to consider how to make your organising more accessible and sustainable? If so the “Organising for Power Programme” may be just for you! To strengthen the movement against racism, xenophobia and the erosion of migrants’ rights in Scotland. “Organising for Power” is a comprehensive programme which aims to strengthen movements against racism and xenophobia and for migrants’ rights in Scotland. 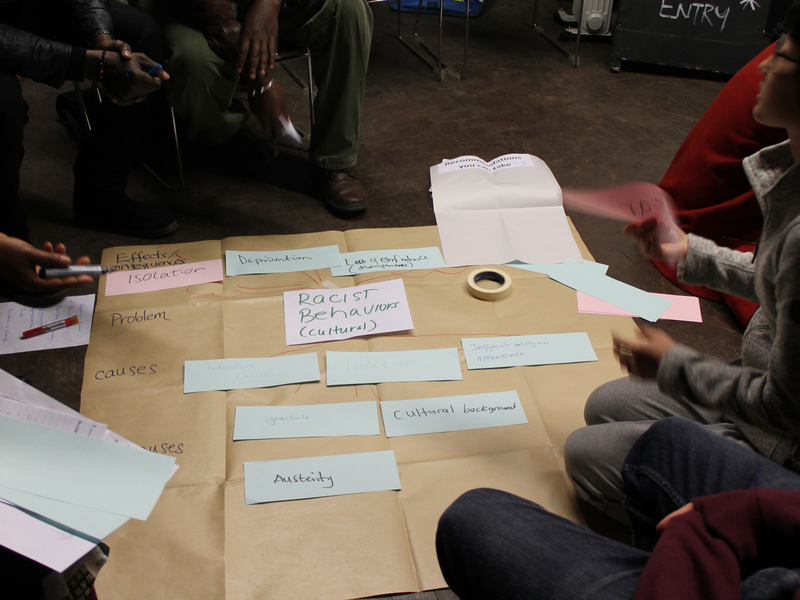 Organising and campaigning for racial justice and for migrants rights can be very daunting with the number of challenges groups in these movements face. After listening to grassroots organisers and collectives like you, we understand the various vicious cycles that keep groups from strengthening their organisations and voice – for example, precarious circumstances surrounding organisers’ lives mean it is hard to focus on strategic actions, a lack of rights, a lack of resources for organisations and a lack of knowledge about the legal system all burden organisers leading to fear, burn-out and hurt. We have also seen over several years of supporting such groups, that group process and decision making and campaign planning are often challenging. Through Organising for Power we want to support you and your groups to work through some of these challenges, to share what works well, and to learn together. This programme will support you to develop your skills as organisers, to support your groups to grow, to increase participation, and to share responsibilities. Organising for Power will support you to develop campaign plans you can actually implement back with your own groups. We will support you to strategise and plan campaigns which have an impact, shift power relations and dismantle oppressive systems. This will mainly be done through three high quality residential training weekends that will include modules on a variety of topics (see below) prioritised by groups we have met and listened to. In addition, the programme will include coaching with Tripod staff members, mentoring with other experienced campaigners and peer-to-peer support for campaign implementation, so that you can review your impact and make changes to your campaign plans accordingly. This will make the programme a living process, adaptive to the contexts you work in for maximum impact. We also envision creating a community of practice among organisers working in this area, where you can share experiences and skills and potentially collaborate with one another in future endeavours. From September 2018 to March 2019, roughly around once a month of either face to face meetings, phone calls or on-line interaction. Skills and tools for improving organisational processes including facilitation of decision-making and effective workload distribution. Group building and developing sustainable group cultures which support active involvement from community members. Skills for facilitating one-to-ones and supporting others to take a more active role in your organisations and campaigns. Understanding power and how to effectively shift the balance of power in your favour. Components of an effective campaign plan including choosing issues, defining aims, matching resources and skills within the group to tasks, identifying allies and building relationships, choosing targets and tactics, creating timelines, reviewing and adapting for increased impact. Supporting disempowered groups and people in crisis. Legal literacy and understanding of rights as refugees, asylum seekers and migrants. How to access and apply for funding for campaign groups. How to ensure personal and organisational sustainability, considering wellbeing and burnout. You won’t find us simply standing at the front of a training, telling you how to do things or what the answers are for we believe in experiential education and know that learning by doing has a strong, long-lasting impact. We centre what people know best: themselves and their own experiences. Organising for Power will include a diverse mix of activities, balancing heart (emotions and intuition), hands (practical experiences) and head (theory and analytical thinking). We will create spaces for you to develop your social change work and learn from each other. Organising for Power is designed to help maximize your learning experience which will empower you to find solutions that will work for you in your specific contexts. Organisers or campaigners tackling the root causes of xenophobia and racism and promoting the rights of refugees and other migrants in Scotland. Anyone involved with any groups fighting for these issues, who would like to learn how to organise their communities and/or campaign for systemic change. This programme is free to participate but with very limited space. We will be prioritising organisers with lived experience of racism, xenophobia and immigration. As this programme will be run from June 2018 to March 2019, participants will need to commit to participate in the activities during the whole period. Creche services will be available at the residential trainings for those with children, just let us know in advance. We would encourage 2-3 people from one organisation or group to come, but you would need to apply individually to be considered. To apply please fill out the application form here by 27 May 2018 or contact o4p@tripodtraining.org with any questions.